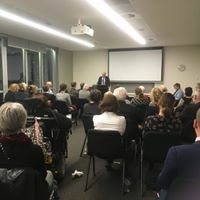 Stephen references the report produced the Human Rights Watch (HRW) entitled ‘I Needed Help, Instead I was Punished: Abuse and Neglect of Prisoners with Disabilities in Australia‘ and reminded us ‘an estimated 18% of Australians have a disability. The over-representation of people with disabilities in the prison population may be seen in the circumstance that almost half of all persons entering prison have a mental health issue (the report uses the term “psychosocial disability”), with more than 25% reporting that they were on medication. These statistics call into question the fairness and effectiveness of the Australian justice system. They also reflect the reality that the lack of comprehensive mental health and social services creates a pathway to prison for people with disabilities. The nightmare continues, of course, in prison. People with disabilities, once in prison, are unlikely to get the support and services they need and are likely to get harassed, abused, assaulted and raped by fellow prisoners and staff’. Please be aware that the content will be upsetting to some. Melbourne visitors to this site will be able to attend our next event with another human rights and social justice advocate, Julian Burnside AO QC on Wednesday 25th July. Details here.